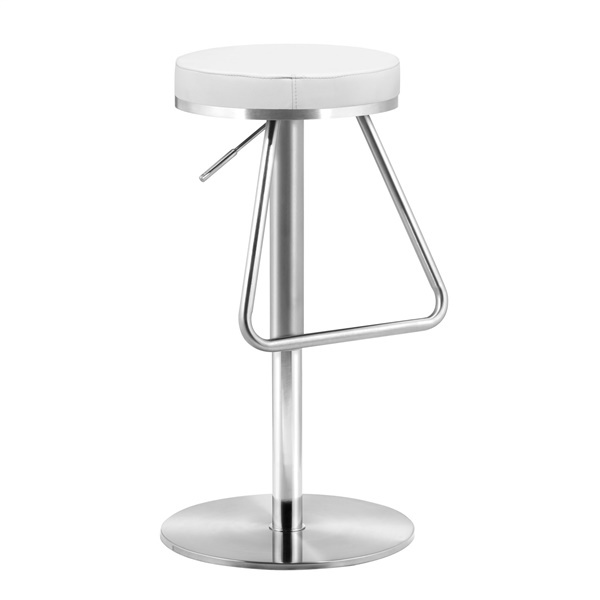 Take a trip down memory lane thanks to the Soda Bar Stool from Zuo Modern. This exquisitely designed bar stool features a plush leatherette seat for supreme comfort, along with an adjustable stainless steel frame that makes it easy for kids and adults alike to use this bar stool at any time. Plus, the bar stool is sold in multiple glamorous colors, guaranteeing you can find a seat that complements your d�cor perfectly. Select a top-of-the-line bar stool that boasts a classic look and feel � the Soda Bar Stool. Sold in multiple stunning colors. Includes an adjustable stainless steel frame that makes it easy for kids and adults alike to use this bar stool at any time. Boasts a plush leatherette seat that delivers superb comfort. Offers a classic design that makes the bar stool a great choice in a retro dining room or kitchen.